1. I had just started my run yesterday when I noticed that Mr. Neil Young was busking near the Halley’s Comet sign. If you are a fan of Neil Young, you will remember the video way back when in which he did the same thing back in the 1970s in Glasgow, which is very similar to Corpus Christi, so this did not surprise me at all. 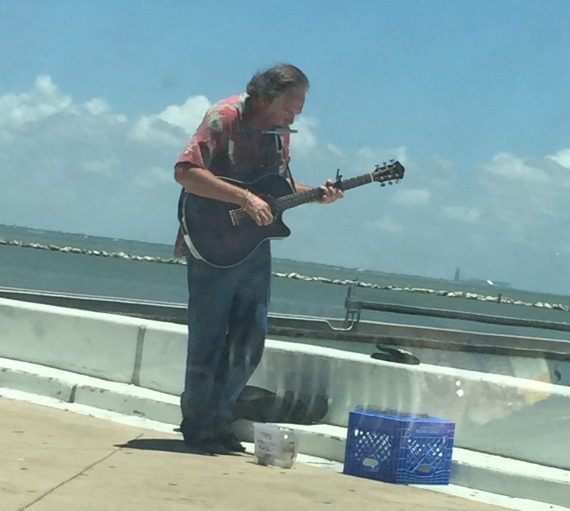 He was playing “Heart of Gold” as I went by. I stopped for a moment to listen, but I was far enough into my run that I couldn’t bag it for later and just sit and listen. Besides, he had announced earlier in the day that he was yanking all of his music from Spotify. This just a week after I finally coughed up the bucks to pay Spotify so I could listen to all his music on Spotify. But, still. It’s Neil Young. Playing on my course. And then, by the time I got back, he was gone. What should I have done? 2. I’m thinking of joining the campaign to change the term “transgender,” which has traditionally made people a little nervous, to “trans-jenner,” which evokes warm, fuzzy memories of Wheaties boxes. Yes, our Wheaties were fuzzy. They generally stayed in the back of the pantry too long till the Cocoa Bombs ran out. The problem: Does campaigning for acceptance of a reformed decathlete somehow imply that I’m in favor of the javelin throw? Because I don’t like that feeling of being impaled during invervals. OK, maybe the last interval when you just want to die anyhow. Should I embrace the social reform movement, or go to the store and get some Cocoa Bombs? Could be the cure for Beanee Weenee withdrawals. Running is more complicated than they lead you to believe in the brochures. You stop and listen to Neil Young! You can always have another run. Amazing! Just Google “1080 NTD in USD” (=34.718). So each bar costs US$4.34. Just Google “1080 NTD in USD” (=US$34.72 for 12 bars). So each bar costs US$2.89.